Since end-users can submit requests using different email addresses and via social media such as Twitter, it's possible that duplicate end-user accounts might be created. The user profile allows you to enter multiple email addresses for a user and then set one as primary, which means that regardless of the email address they use to submit a request, they are properly identified and a new user account is not created. A duplicate user account can also be created if the end-user submits a request via Twitter and their Twitter account has not been added to their user profile. Note: If your account uses single sign-on and handles user authentication with JWT or SAML, you can merge users only if there's no external ID associated with a user. 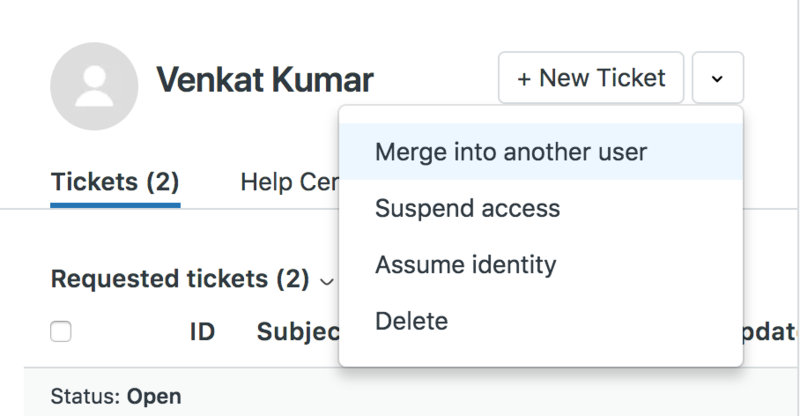 After merging accounts, any tickets created by the duplicate (now merged) account are updated with the primary user account. Important: A merge cannot be undone, so be careful to select the correct user accounts. Enter the name of the user you want to merge in the search box and click the user's name when it appears. Alternatively, you can open a user's profile from one of their tickets. Click the User options menu in the upper right, then select Merge into another user. Enter the user's name and all users that match what you entered are displayed. Select the correct user and then click Merge. When prompted, click Confirm and Merge to confirm the merge. If you want to cancel the merge, close the window instead. 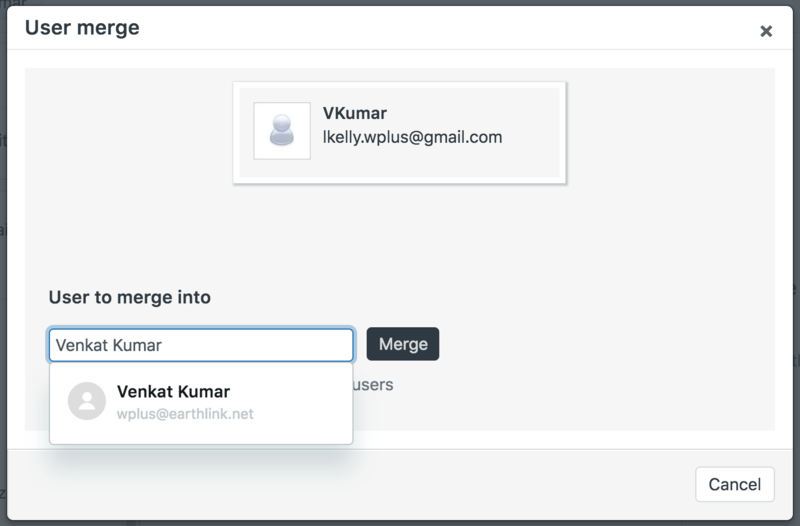 When you merge one user account into another, the tickets owned by the user account being merged become the tickets of the user that account was merged into and the data in each user profile is combined. The following table describes how user profile data is handled as a result of a merge. The user being merged is referred to as the merging user and the target of the merge is referred to as the receiving user. In general, the merging user will lose all data, except for tickets and email identities. Tickets All of the merging user's requested tickets are now requested by the receiving user. CCs are treated similarly. Note: Closed tickets will still show the merging user's ID. Direct Line Receiving user's value is not affected by merge. Primary email Receiving user's value is not affected by merge. Secondary email All secondary email addresses are maintained, merging user's email is added as an additional secondary email address. Language Receiving user's value is not affected by merge. Time Zone Receiving user's value is not affected by merge. Organization Receiving user's value is not affected by merge. If multiple organizations are enabled in the receiving account, all organizations will be merged. If multiple organizations are not enabled and there is no original organization only one will be merged. Tickets aren't automatically updated and may maintain old organization values. Tags Merging user's tags are lost. Details Merging user's details are lost. Notes Merging user's notes are lost. Picture Receiving user's value is not affected by merge. Fields Receiving user's fields remain intact. Merging user's fields are lost. External IDs Merging user's external IDs are lost. We have a web service with accounts. We have a user who used our form and asked that we delete her account within our product. While we were processing her request, she contacted us a second time but typo'ed and this time added an extra L to her email address. Consequently, we have two users in our database, jane@hotmail.com and jane@hotmaill.com (with the two L). Neither of these accounts are verified. Because she initially wanted to delete her account, we don't want to send her a verification request after the fact, much less two. What we'd really like to do is merge both tickets and both accounts into one ticket and one account so we can state with authority that we did delete her account as requested. Hi David! Sorry for the delayed response. You can manually verify the user's email from within the user profile. Just click the little down arrow next to the customer's email address. Does that mean there can be no external id associated with either user, or the user being merged, or the user being merged into? I have users who are chaning their primary email address, and less often the external_id, and I need to automate merging accounts. Phone number Receiving user's value is not affected by merge. Both phone numbers will be saved on the receiving user. I have observed this behavior consistently. I have also observed exceptions, where the merging user's phone number was not saved to the receiving user's, but was not able to isolate the behavior. Hi Zac! Thanks for pointing this out. I'm going to have our documentation team take a look at this and get it updated. It makes sense that since the multiple phone numbers feature update that this behavior would be expected. Again, thanks for pointing this out! What happens if you both offer Phone and Email support and you have the following scenarios? End User Calls into support for the first time and doesn't have a phone number on record, just email. Will a new End User be created? How do I associate that caller to the existing End User? End User emails into support for the first time and doesn't have an email address associated with their End User profile but does have a phone number. In both your scenarios, a new user profile will be created in Zendesk, but you can merge those two profiles together. A good way to ensure that duplicate profiles aren't floating around is to have your agents ask the new customer for additional contact information to fill their profile out as completely as possible. 1. Is there a way to bulk merge users using the core API across the database if they have the same email address? 2. Is it possible to bulk merge organizations having the same domain. I really need the ability to do either one of the above. We have massive amount of duplicate Organizations due to the fact that we had provisioning accounts pushed from salesforce. We are moving away from that structure to a one customer account model in salesforce and need the same reflected in zendesk as well. Hi Leslie! It's definitely possible to use the API to merge users - see the Merge Users call. It's unfortunately not possible to merge organizations, but you could perform a bulk organization update using the bulk update tool, or use the Update Many Organizations endpoint. Let us know if you run into any difficulties with that! Hello Jessie, you wrote "in both your scenarios, a new user profile will be created in Zendesk, but you can merge those two profiles together." in your answer to Will. The scenario Will described is what we are facing here as well. I want to merge "call" customers into existing "email" customer profiles. Why the limitation? Hey Eckhard! Thank you for your patience! In the article, it only states you can't merge into a user with only a direct number. The scenario you state (merging a direct line user into a user with just an email) should provide you with no issues, and is something we do every day here. Let us know if you run into any trouble with this! Is there a way to search for duplicate accounts? We would like to merge any duplicate end users that we have. Welcome to the Community, Shane! The user profile doesn't have any attribute that denotes a duplicate, so the only way you'd be able to do this would be by searching by user name. This can get tricky, since it's possible to have two users with the same name who aren't the same person. What channels are you using that are bringing in potential duplicates? Is it possible to un-merge 2 end-users who have been merged in error? Hey Erin! It is not possible to un-merge users, you will want to create a new user with the information that you remove from the user that was merged into, and re-create any tickets requested by them, if needed. I would also like to learn more about searching duplicate users and bulk merging, if possible. We have multiple email and social media channels. There isn't a function to bulk merge users built in to Zendesk. You would need to use the API to do this. You can find that documentation here. Is it possible to remove one of the email addresses after merging two end-users? (One of the end-users should never have existed. Therefore, I want to merge all tickets for the two end-users and delete the wrong email address). Hi Elise! Welcome to the Community! You can definitely do this! Go to that user's profile and make sure that the correct email address is set as their primary email. If it's not, click on the correct one and select Make primary contact from the dropdown. I successfully merged an account into another; I can see the merging user's tickets listed under the receiving user's. However, the receiving user's request list (via the iOS SDK) doesn't show the newly merged tickets. Does the merge take a little while to propagate to devices? Or do merges only show via the admin interface? Any time there is a user merge, both user's historical tickets are listed under the remaining user, so it sounds like there may be a caching issue in your case. If you still aren't seeing the full ticket history, please drop us a line at support@zendesk.com, we will be happy to look into this with you! Hi Jon — Thanks for the quick response! Yeah, I'm still not seeing the historical tickets listed under the receiving user. I went ahead and shot support@ an email as you recommended. will users that have basicaly the same main e-mail address be merged automatically or will Zendesk create a second account. And if the later one happens, how can we distinguish between both of them? If the user's have a consistent email address from your SSO directory -> Zendesk, it will attribute any additional information to that specific user. SSO will only create a new user if the email does not exist currently within Zendesk. We treat the email as a unique identifier for each user in your account. If you have additional questions, we can certainly bring this into a ticket as well! I have an agent that is unable to merge end user accounts. The dropdown (pictured) that I have next to "New Ticket" when viewing a user does not appear for this agent. Is there a setting to grant access to this feature for agents? This functionality should be open to all Agents out of the box. That being said, if you've put any custom roles in place, that may have shifted the functionality and you may need to add it. Do you know if you have any custom roles active? I have the Support Professional subscription, so I don't think I have custom roles in place. Maybe I had custom roles during the trial period and made a setting change of consequence. If so, could I have the feature to merge users reactivated for all agents. This is something that's probably going to be best handled in a ticket with our support team. I'll get a ticket opened up for you; you'll see an email from me shortly! Is there any way to see which profiles have had any sort of merge? More from an audit standpoint. Merging profiles does not come up on the audit log and it would be great to see which agent performed the merge and what accounts. In fact, how about a section per profile which details this information plus the date and actor of suspensions, language assignment etc?